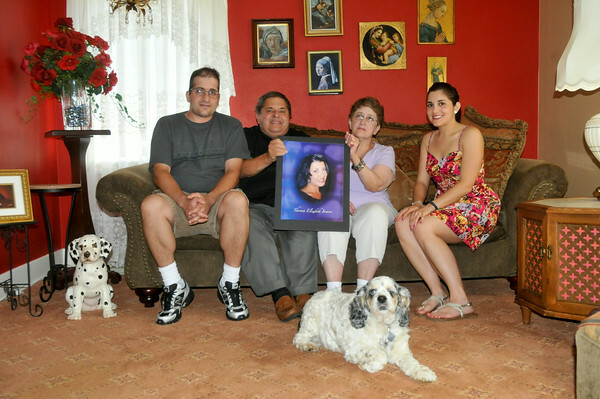 DAN CAPPELLAZZO/STAFF PHOTOGRAPHERNiagara Falls - Flanked by son and daughter Maribeth Insana, 23 and Christopher, Joseph and Ann-Marie Insana hold up a photo of their daughter Theresa Insana who was murdered in October of 2004 in Las Vegas. The unsolved case will be featured on Dateline NBC this evening as part of their Cold Case segment. Also pictured is Theresa’s dog Frankie, a cocker spaniel.